Subscribing to Sabrina’s e-newsletter lets you be one of the first to find out all the hottest details on your favorite novels and other exciting updates. View her latest newsletter here. 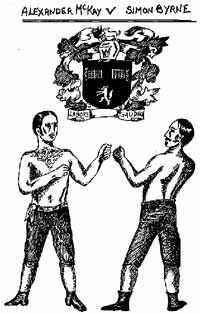 A love of boxing was pretty standard for young lords in the Regency. Since it was illegal to have pugilist matches, organizers had to resort to a great deal of subterfuge to arrange “mills,” as the events were called then, so he would have found that an enticing profession, since he’d been disinherited. A hundred years earlier, there were even matches for ladies, who fought bare-breasted. Though it sounds like the Georgian equivalent of the wet T-shirt contest, women boxers had supporters like any of the men and fought in major arenas. A woman named Elizabeth Wilkinson-Stokes even became quite famous for her abilities.